In anticipation of Community Manager Appreciation Day (#CMAD), coming up on Monday, January 28, HootSuite is happy to provide a collection of helpful community management resources. Read on for descriptions and links to exclusive content which can help with your community building and social media management efforts today. Community managers are tasked with listening and engaging 24/7. Let’s assume you don’t enjoy the luxury of your laptop, computer or social war room every hour of every day. Luckily, the HootSuite mobile app allows you to securely manage your social media from the palm of your hand. Here at HootSuite, we’re constantly trying to provide the absolute best tool for managing your social media. Feedback from friendly users is very important to us and given that community managers are clearly HootSuite power users, we have an exclusive opportunity for you. The Community Manager demo program launches on Community Manager Appreciation Day, but you can get early access for this exclusive opportunity by filling out this trusty form. We’re only accepting ten submissions, so get your application in early! Learn from the leader behind HootSuite’s expanding global community (Dave Olson), and explore the importance of listening and giving first, recognizing and respecting different cultures, and building strong relationships with your first fans. HootSuite recently released its first Community Nuggets video, featuring VP of Community, Dave Olson. Check out the video, entitled ‘Crowdsource from your Community the Tom Sawyer Way,’ for tips on the delicate art of crowdsourcing, and find out the best ways to motivate your community to work with you. Whether you are working as a consultant, realtor or social media manager, this series of industry-specific info sheets will help you. There’s lots of tips and talking points on different ways businesses can take advantage of social media. There are also specific guides on topics including social media security, community building and social analytics, among others. Feel free to browse our library of info sheets. For more in-depth information on how to use the HootSuite Dashboard, check out our collection of HootGuides. For example, the Social on the Go – Mobile HootGuide gives practical tips on how to manage your social networks on the go. Don’t forget about all the excitement for Community Manager Appreciation Day! 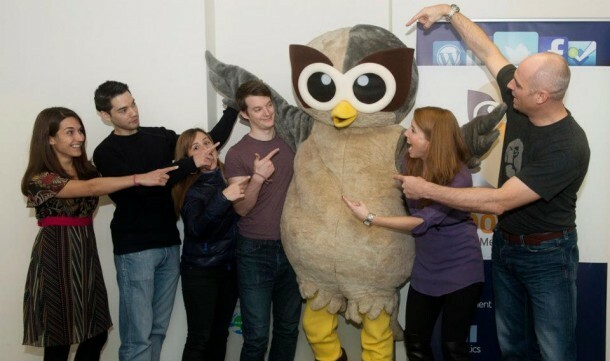 Your friendly Owls at HootSuite are also co-hosting a 12 hour #CMAD Hangout. These are some of our latest internal hits for community building. What are your go-to resources for community management best practices and tactics? Where do you go to learn? Please share any useful links or tips by leaving a comment.